Cybersafety – keeping our kids safe online! As part of my role as Head of ICT and Learning Innovation I have taken responsibility for re-writing the technology curriculum. The first (and for me, one of the most important) part of this is establishing an effective and up to date Cybersafety programme at all levels in my school, including the upskilling of staff and parents. After a lot of research I discovered one of the best Cybersafety resources available on the net: Cybersmart – An Australian Government funded initiative available for free to anyone, anywhere in the world! Cybersmart is a national cybersafety and cybersecurity education program managed by the Australian Communications and Media Authority (ACMA) as part of the Australian Government’s commitment to cybersafety. The program is specifically designed to meet the needs of its target audiences of children, young people, parents, teachers and library staff. The website is split into specific age groups for teaching Cybersafety and Cybersecurity to students: 0-7 Year olds, 8-12 Year olds and 13-18 Year olds. The other part of this resource relates to parents, teachers and library staff. This is definitely a resource that you need to share with everyone you know – I highly recommend it. It is a one stop shop for everything you need to know about staying safe online. I came across this site through a contact at school and it has not let me down. I am currently teaching Cybersafety to my Year 4-7 students and am getting documentation prepared for the introduction of Cybersafety from Preschool. It is a very exciting development for me and something that I am very proud of. As I get my resources together I would be more than happy to share the program with others. 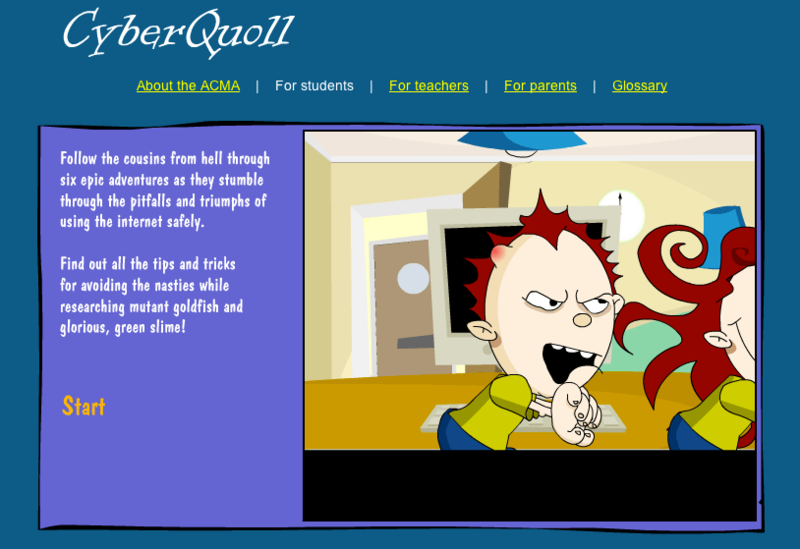 Cyberquoll is another resource from ACMA and one that I used as a primary link to hook the students in from Year 4-7. It was a great starting point and a way to give a general overview of some of the basics of being online. To go along with these videos are resource sheets for teachers to use with students, however I decided to create and tailor my own to the needs of my students and would recommend that you do the same. My suggestion is that you log in and have a look around. I found it very easy to use and very easy to set up my program from this very in depth and down to earth resource. 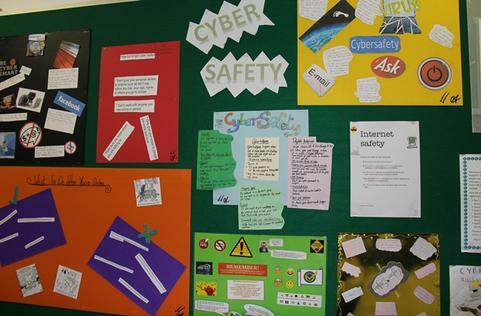 Students have created a variety of presentations (including videos, podcasts and information posters) to help educate others on what they have learnt so far through our Cybersafety program. It is great to see the students so involved and we are planning some parent sessions soon as well. I would be happy to discuss this further and share my resources with you. Have a look at this amazing resource and feel free to share what you do as part of your Cybersafety program. If you need complete parental control for the iPhone or iPad, check out FREE McGruff SafeGuard. McGruff “Take A Bite Out of Crime” is famous in America for family safety for over 30 years. They also provide have a PC-based Parental Control system: (http://www.GoMcGruff.com). McGruff SafeGuard released a Child Safe Browser app which is a look-alike for Safari, but provides a parent with complete control of the categories of websites that a child can visit. It also provides a summary of activity to the parent via email. Thanks for sharing this, Craig. I wasn’t aware of Cyberquoll and I’ll be taking a look for our CyberSafety program. We come back to it often, at least once every term. It’s interesting to see people are using CyberSmart outside of Australia. That’s excellent!